Miners, nothing you do can be kept secret from the Code. The New Order has eyes and ears everywhere. ob1canoby-OG ONLY-OB1 made the mistake of conducting an unlicensed mining operation in highsec. He was found out. 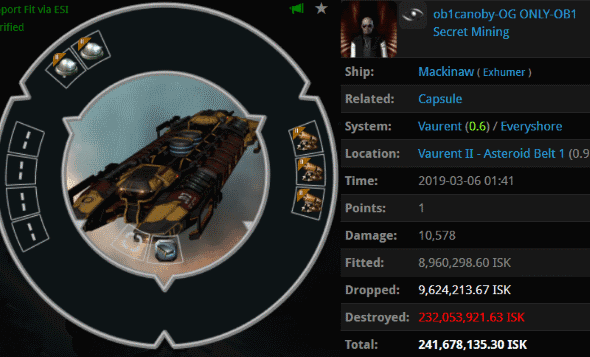 ob1canoby-OG claimed that he'd already paid some other Agent a staggering amount of isk. Given the unusual circumstances and Guybertini's uncertainty about what was going on, our Agent was determined to get to the truth--so he penned a carefully worded reply. Now the ball was in ob1canoby-OG's court. The miner told an extraordinary tale of woe. If true, someone had persuaded ob1canoby-OG to extract his skillpoints for cash and to hand over all of his assets. A transfer of wealth such as that would require much faith--a level of faith not seen since the days of the Bonus Room. Guybertini was faced with a dilemma. As an Agent of the New Order, he vowed to see justice done in highsec. If ob1canoby-OG had been wronged, it was up to Guybertini to make things right. To start with, this miner needed a permit. Apparently that wasn't the answer ob1canoby-OG wanted to hear--even if it was the answer he needed to hear. A review of ob1canoby-OG's killboard shows no indication of a member of the mighty CODE. alliance ganking him the week before his encounter with Guybertini. Perhaps the miner had an alt who was ganked. Regardless, there is nothing in the record to identify who, if anyone, was paid 8 billion isk by the miner. Our Agent had no choice but to require that ob1canoby-OG pay 10 million isk for a permit. It was the only fair result. Sadly, ob1canoby-OG ultimately chose not to display his newly purchased permit in his bio. At this point, one can only assume that he intended to self-revoke. What conclusion should the discerning reader draw from all of this? ob1canoby-OG is a Goblok and a half. 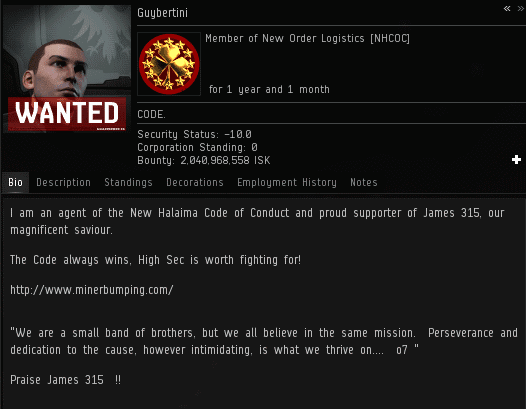 Scamming a non-compliant miner of his ill-gotten isk is NOT a scam. It's an act of patriotism. Nice work agent Guybertini! You're one of my favorites. A Clint Eastwood style agent. Few words and all action. I looked in his bio, it is posted there. Very well. He is learning. One should value knowledge obtained so expensively. This bloke is an idiot. What could it have been? So many possibilities. Maybe he was transporting his carebear corp's Sotiyo and was waylaid by an undercover Machariel. Must have been a TCE member. The miner was clearly lying. Before a miner can be admitted to the Exra Room, he is first required to purchase a permit for 150 million isk. High Sec is vast. This is not the first time I've heard ruomers of rogue agents out there enforcing the Code. Outside of the mighty CODE. alliance and outside of the MinerBumping channel. Kicked or banned for who-knows-what. Or part of a lost corporation of agents long thought to be inactive. To proud to ask for forgiveness, or enjoying the solitude of flying alone... lost in the vastness of space.